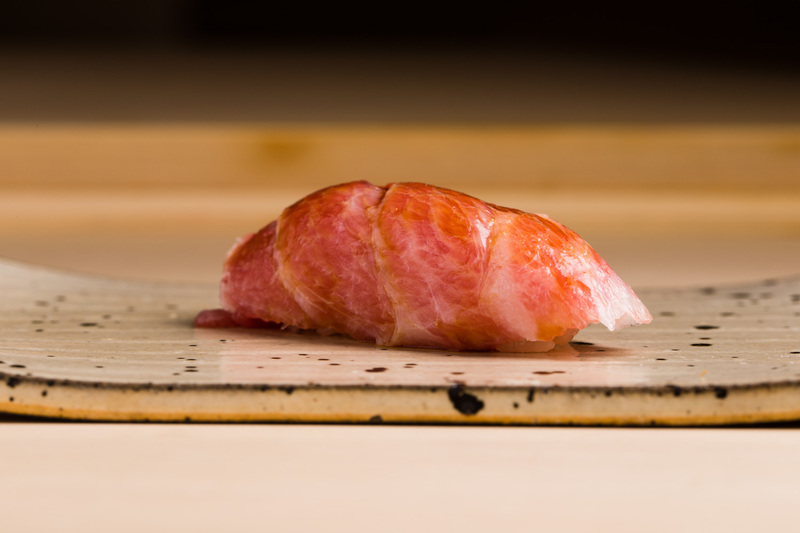 For the love of sushi and an earnest desire to share that with customers, whose comfort and happiness is paramount: Miyakawa presents delicious, approachable sushi shaped by the hands of a chef who has the honor of earning three Michelin stars. With a focus on the innate flavors and umami in ingredients, Miyakawa’s genuine manner and delectable sushi justify a trip to Hokkaido. Miyakawa was one of the first of many high-end restaurants to take up residence in Maruyama, Sapporo. 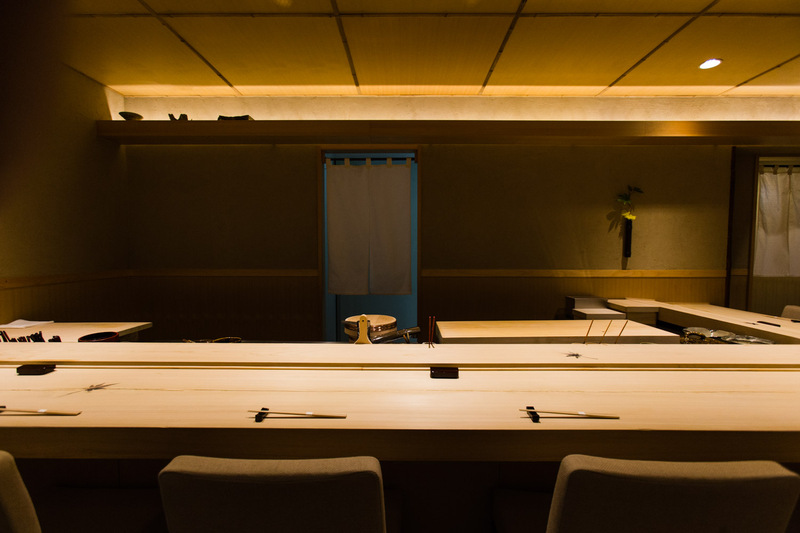 As you open the door into this quiet and highly atmospheric place, the rich scent of hinoki Japanese cypress fills your senses and leads you into a pristine space with an L-shaped counter of single plank hinoki seating eight. The culmination of the chef’s study of restaurants throughout his illustrious career, this exclusive space is just as Chef Miyakawa hoped it would be. Persimmon wood inlaid in the counter in the shape of leaves is a beautiful natural accent, so real you almost feel like you can pick one up. Miyakawa adopts a style showcasing the best of Edomae sushi whilst weaving in ingredients from the chef’s native Hokkaido. The emphasis on tsumami small plates shows the chef’s skills polished through several years at a washoku traditional Japanese restaurant. That experience allows Chef Miyakawa to serve tsumami dishes on a whole new level that never fail to surprise his guests. 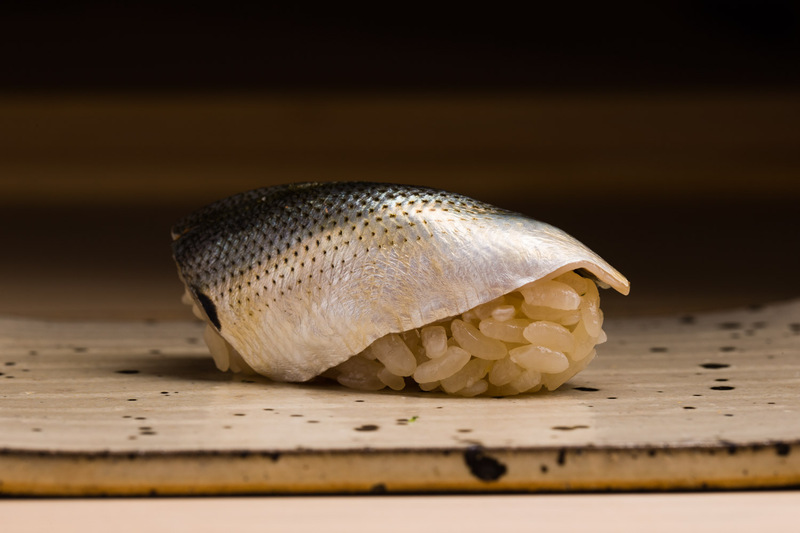 The sushi is all about umami and drawing the maximum flavors from an ingredient, adding only the bare minimum to make that possible. With no unwanted flavors or coarse edgy elements, every morsel is delicate. You get a strong sense of the chef’s gentle heart and love for his work as you enjoy his delicate cuisine. 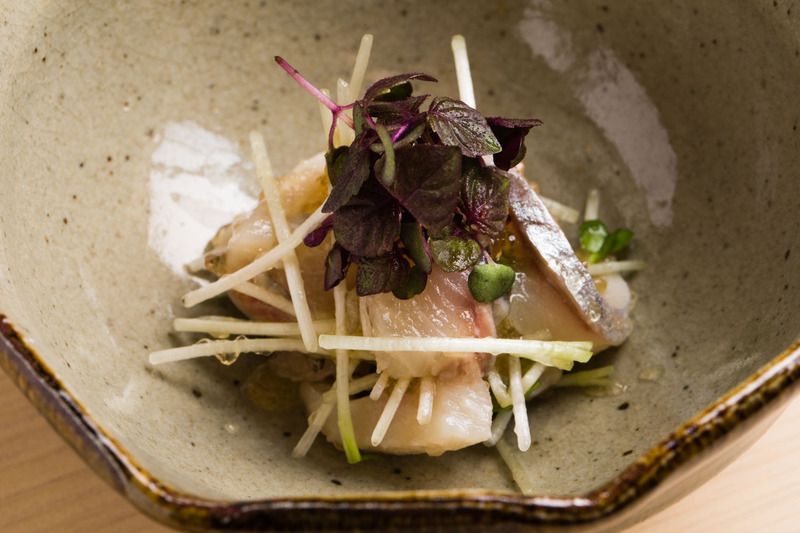 Rosy pink-skinned seared sea bream from Shizuoka is accompanied by wasabi and a pinch of salt followed by Hokkaido herring topped with a sprinkling of sudachi citrus gelee, offer insight into the delicious small plates Miyakawa serves. Then come delectable sushi bites, such as marinated tuna block as well as fatty tuna, both from Oma Port in Aomori. Served piece by piece on a speckled rectangular plate, you lean in to watch the chef’s busy hands and see what may be coming next. 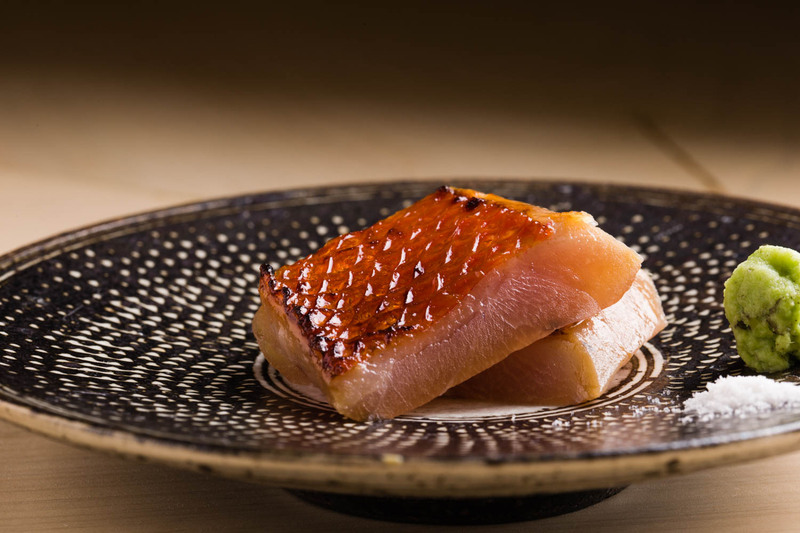 The buttery raw flesh of blackthroat seaperch is accented with umami from the kombu it has been pressed in overnight – a wonderful surprise for a fish more often served seared or grilled. 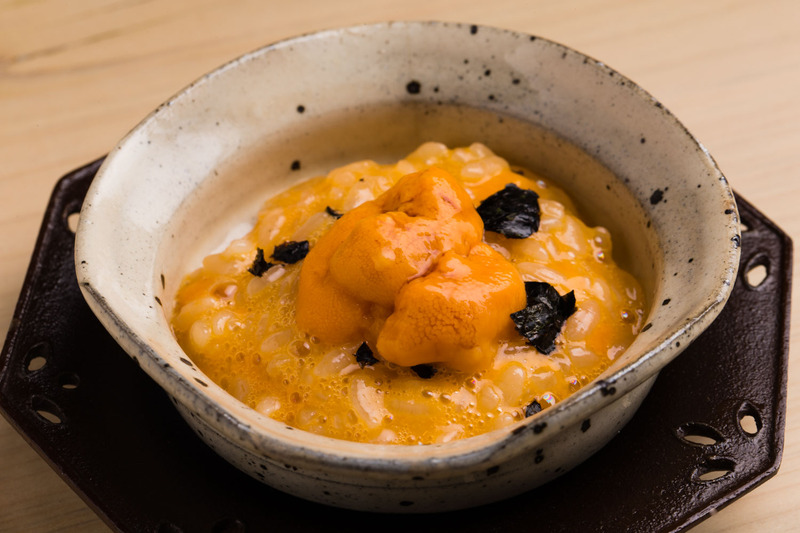 Sweet, succulent uni comes next, perched atop a bowl of rice dressed in bright orange sea urchin sauce with striking flecks of black nori seaweed. 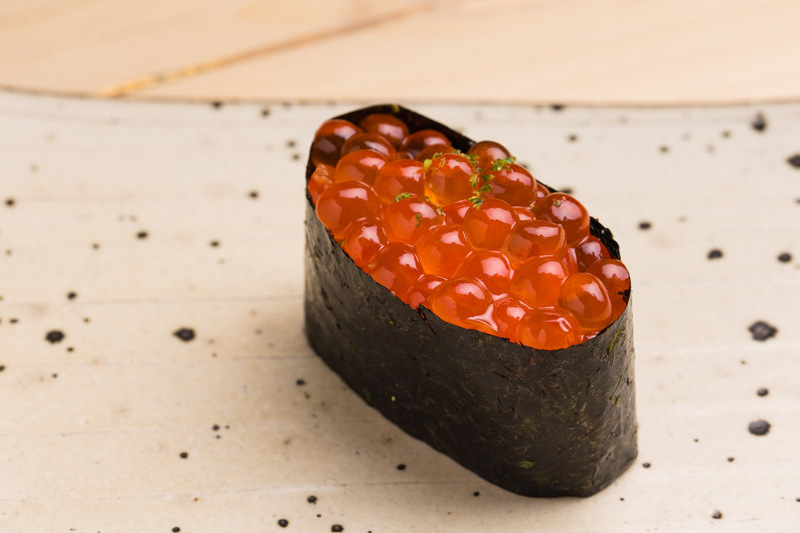 Then comes another Hokkaido delicacy – the jewel-like sparkling orbs of orange ikura salmon roe with the dainty green zest of sudachi. 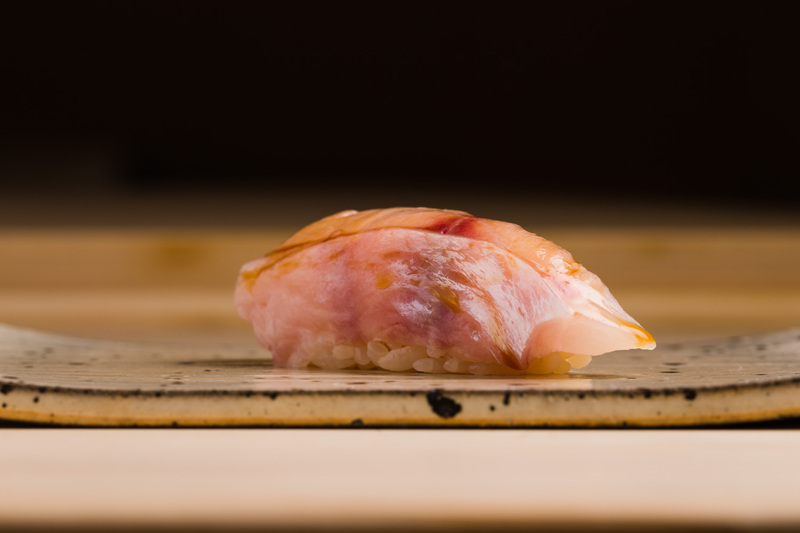 With a strong conviction that sixty percent of sushi is about shari – the oval rice that sits beneath the seafood – Miyakawa pays a great deal of attention to its texture and seasoning. Perfectly moderated by the natural fish oils, just a hint of akazu red vinegar is used so as not to interfere with the seafood topping. And because the fat content of fish changes with the season, so must the rice recipe. The mix is currently a base of the highly acclaimed Hokkaido varietal called Yumepirika, with a touch of Koshihikari for the perfect consistency. Chef Miyakawa’s intention is not to limit himself to Hokkaido ingredients, but a clear passion for them sees him incorporating them whenever the quality matches his discerning tastes. This is especially true of incomparably delicious Hokkaido kombu and wakame. The seasons in Hokkaido differ to Tokyo, greatly affecting flavors, a factor that threw Miyakawa when he started making sushi in Hokkaido again. It led him to frequent the markets, to talk to suppliers and study the produce. 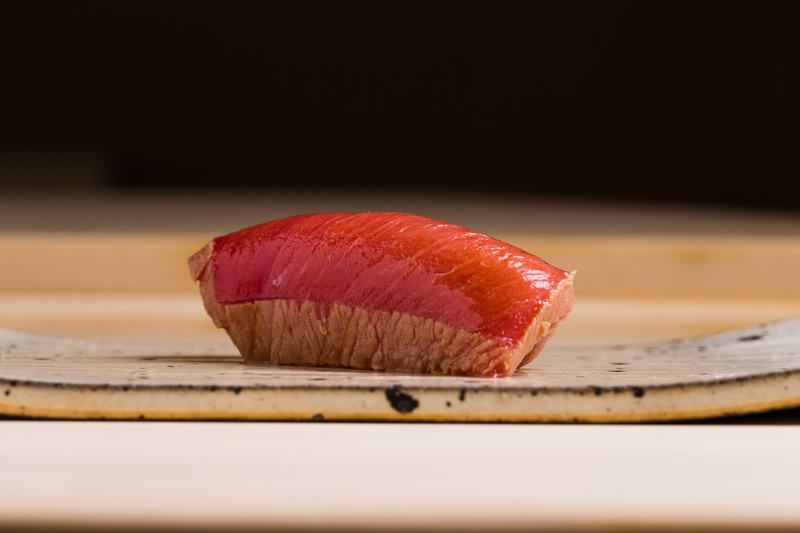 The discovery that despite being caught so close to home all the best maguro tuna pass through Tsukiji necessitates procurement of maguro through Tsukiji, but other ingredients lead Miyakawa to all corners of Japan. With especially strong connections in Shizuoka and Shimane, Miyakawa meets with fishermen and farmers there as much as he can. He is a firm believer in meeting face to face and finds it is the key to securing the best. Masaaki Miyakawa is 47 years old and hails from a small town outside Asahikawa in rural Hokkaido. His family was never involved in the food industry, but from a young age Miyakawa was very adept at craft. He set off for the capital after graduating from high school, searching for work at a sushi restaurant for one pure and simple reason – he loves sushi. He joined Sushiden Kenzan, where he met the man who has become his master and mentor, the three-star chef of Sushi Yoshitake. After seven years, Miyakawa returned to Hokkaido for work at a washoku restaurant, only to discover how deeply he loved and missed standing at a counter to see his customers’ faces and reactions. 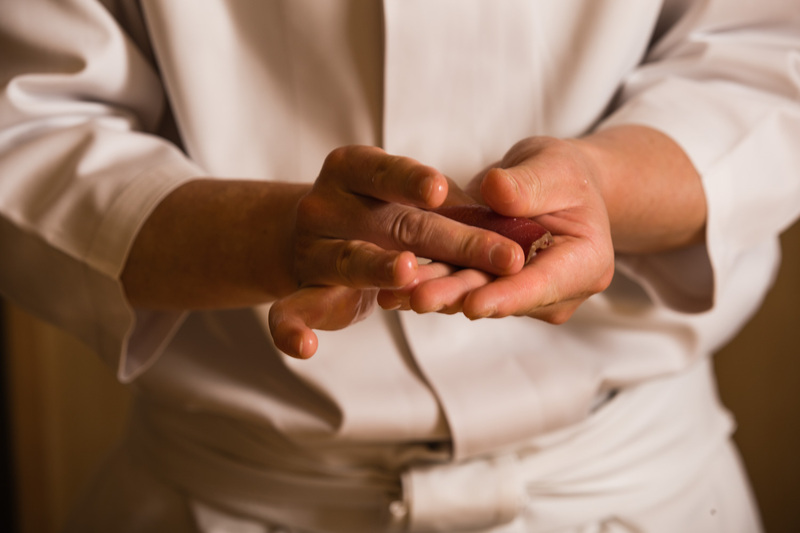 It was this realization that has shaped Miyakawa’s attentiveness to guests and made him such a sought-after chef ever since. 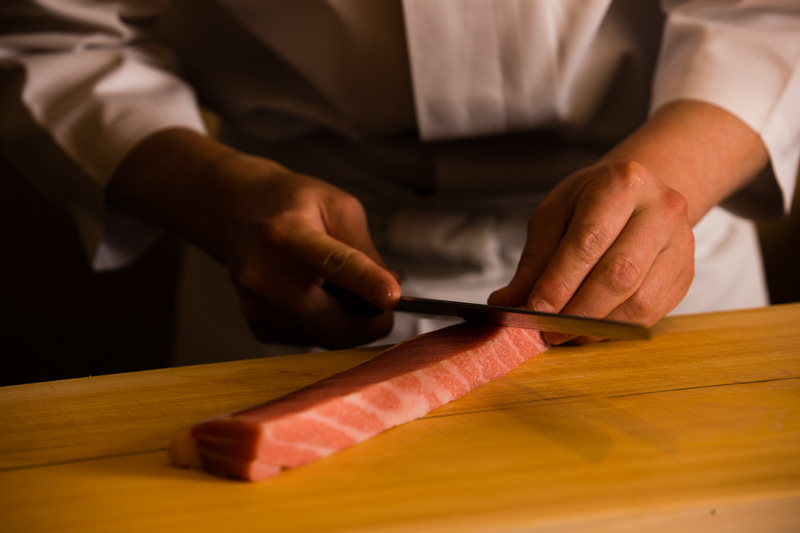 Before returning to the world of sushi, Miyakawa chose to add one more style to his varied career – he trained in French cuisine at Sapporo’s famous starred French restaurant. His foray back into sushi saw him not only as chef but also manager, with overall responsibility for accounting and management of his restaurant. Miyakawa’s big turning point came at the age of 40. Contemplating a return to Tokyo to go independent, a call came from his mentor Yoshitake inviting him to stand at the counter of his new restaurant to be opened in Hong Kong. The two chefs took turns, switching between Tokyo and Hong Kong, and Miyakawa played a major role in Hong Kong’s Sushi Yoshitake earning three Michelin stars. The second taste of stardom came after Miyakawa’s return to Hokkaido, prompted by a desire to be home with family. 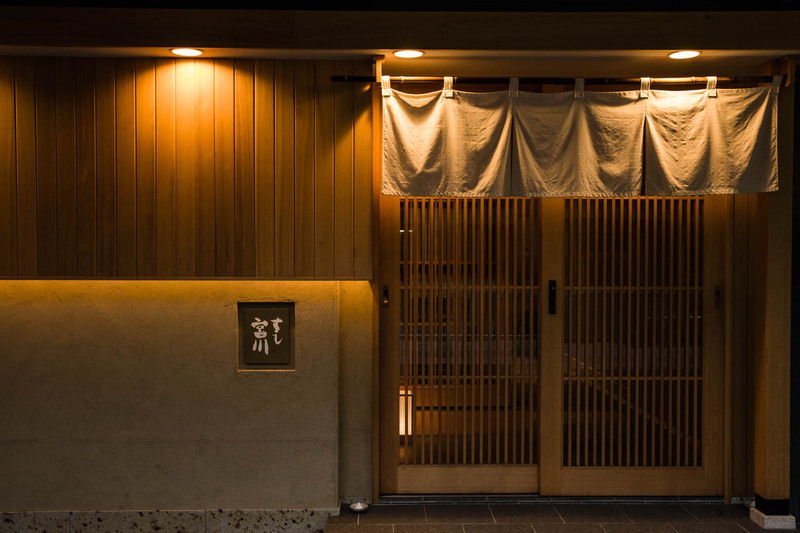 He established Miyakawa in 2014, and just three years later in 2017, earned three Michelin stars. Miyakawa’s mind is constantly filled with thoughts for his customers. He knows there are countless establishments serving delicious cuisine, but only a few that can send customers off fully satiated in both a physical and emotional sense. Standing at the counter to witness and accentuate the customer experience is the real appeal of the job of sushi chef for Miyakawa. And he is exemplary in that role. Miyakawa is constantly seeking ever higher quality and contemplating how to shape the dining experience so that it goes beyond being delicious to being highly satisfying in every sense of the word. Considering expansion overseas, he decided to open Shin in Niseko as a first step, sharing not only his skillful cuisine with guests from every corner of the world, but also making them feel truly welcome in his space and in Japan as a whole. 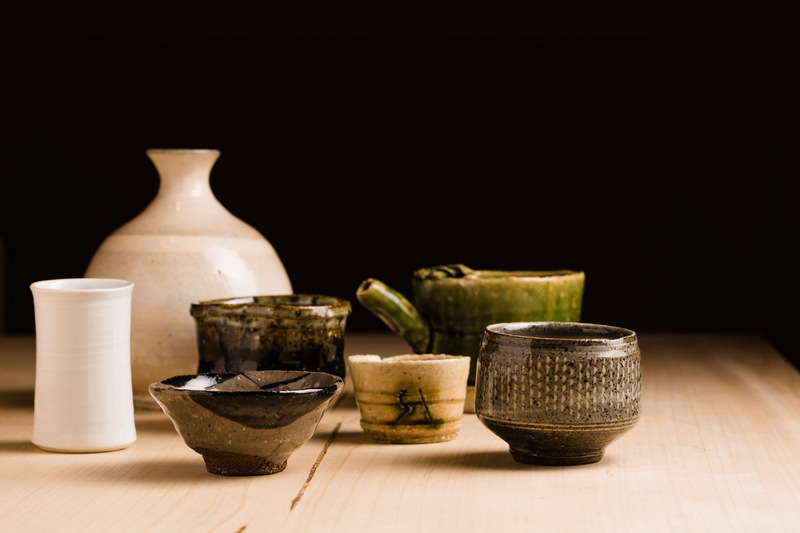 Most of Miyakawa’s tableware collection is Karatsu Ware – a ceramic style from Saga Prefecture characterized by earthy tones and undecorated or unglazed finishes. He especially loves the work of Taki Nakazato. He finds the potter’s pieces to be highly functional and appreciates how they state their presence without being overbearing, perfectly complementing Miyakawa’s cuisine and demeanor. 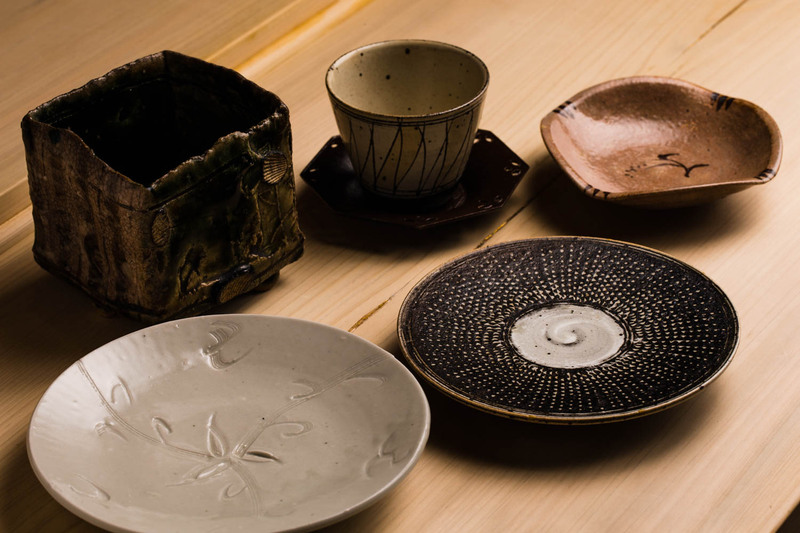 Miyakawa makes occasional visits to the climbing kilns in Saga to understand where the incredible pieces of tableware come from, including the clay that shapes them, adding to the layers of the story which he expresses in his cuisine.